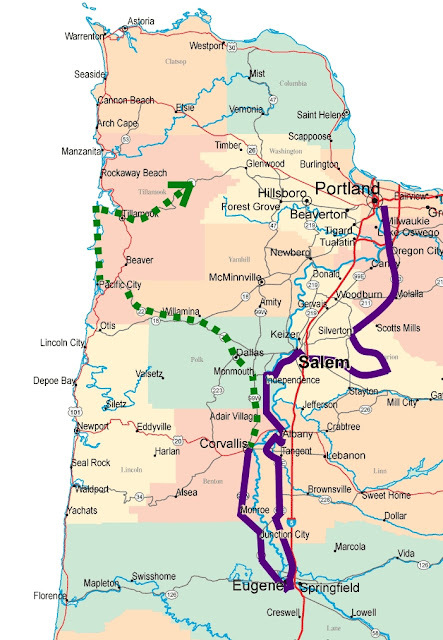 It's about 80 miles from the City of Roses to Corvallis, Oregon, but my running Avatar is not the sort of chap who does things in a boring straight-line sort of way. He has logged about 226 miles since he was launched back in late October, whim and circumstance taking him to all sorts of places of significance to myself and some of the readers of this online entertainment. The Hypothetical Hypermarathon, 225.81 miles in. 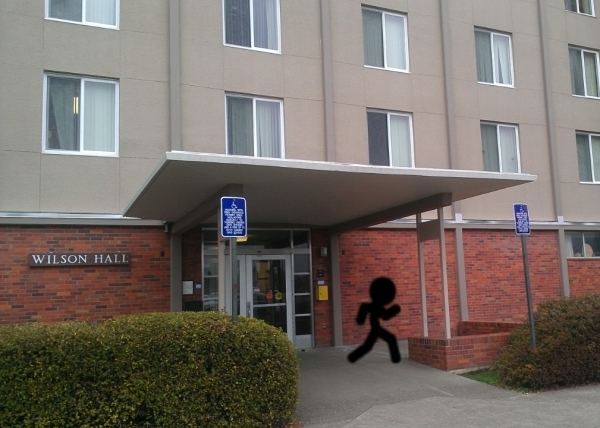 Last Sunday, he finally made it to his first stated destination, the campus of Oregon State University. Ever since, he's been hanging out in frequent contributor Morgan's room, resting his virtual legs and participating in whatever God-knows-what sort of crazy and unspeakable business the College Boys of Today get up to in their dormitory cells. 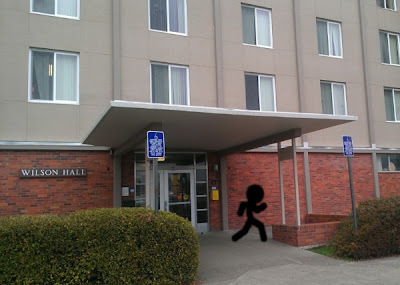 The Avatar arrives in Corvallis. Photo by Morgan. The next couple hundred miles are shown in dotted green on the map above. Assuming his determination and legs don't fail him, the Avatar should be checking in from Monmouth (where two of my sisters went to college) and beautiful Dallas, Oregon (from where two of my running buddies proudly hail) before crossing the Coast Range hills and getting his virtual shoes wet on the beach. Once that happens, he'll have established one coast of a coast-to-coast trip; from there it's just a simple matter of getting to the second coast. If you have suggestions for places you'd like the Avatar to visit, you are always welcome to say. Say, you know what I just noticed? The Avatar has now run in seven counties! The Avatar could always stop by Rivers Edge Chevre in Logsden (outside of Siletz) for a lovely rural/coastal detour. And excellent goat cheese. I'd love for the Avatar to come to Jersey … I know it will take some time but get moving! Stop tooling around Oregon already! E: May not be able to backtrack to Siletz. I'm under a lot of pressure to get to New Jersey.